Disclaimer: the cover image is a fan made illustration, not actual in game footage. Ho-Oh, Lugia and Celebi are not available in game. Lugia, the leader of the Kanto Birds, has the highest Defense stat of all Gen 1 and Gen 2 legendaries. Lugia is tankier than Snorlax, and has a max CP above Dragonite. Lugia’s best moveset is Extrasensory/Sky Attack or Future Sight, which puts it on par with Lick/Hyper Beam Snorlax and Mud Slap/Earthquake Golem. Harder to kill than Snorlax, and gets higher placement in gyms than every Pokemon in the game that isn’t Tyranitar, Ho-Oh, or Mewtwo. It has a defensive damage output with Extrasensory/Sky Attack on par with Volt Switch/Wild Charge Raikou (reason being Raikou does more damage per second, but Lugia lives longer and catches up over time). Lugia is the only Legendary Psychic type not weak to Bug. However, it has many weaknesses. Ice, Electric, Ghost, Dark, and Rock. Gengar does the most damage to Lugia, but you’d have to dodge pretty much everything or he dies. Lugia has a rare typing that allows Bite/Stone Edge Tyranitar to be completely Super Effective. Jolteon and Jynx also can deal quite a lot of damage. Nonetheless, Lugia gets excellent gym placement and does not easily go down, thus I’m confident stating that Lugia (as of now) has what it takes to make a top tier gym defender. Lugia has a solid damage output and can tank even more damage than Snorlax. It will make a great generalist attacker. It wins matchups against similarly leveled Blissey with plenty of time and will have more HP left over than most. And it joins the very small club of Pokemon that can beat Blissey without dodging (as long as the charge move on Blissey is Psychic). Ho-Oh is a god. Despite Lack-of-STAB syndrome, Extrasensory/Fire Blast is backed up by a massive 263 Attack stat, and it will still have comparable DPS to Air Slash/Overheat Charizard, while being tankier than Snorlax. Ho-Oh only has to compete with other Ho-Oh and Mewtwo for gym placement. A 0%IV Level 32 Ho-Oh has a higher CP than 100% IV Level 40 Tyranitar. Because of the combination of attack power and durability, Ho-Oh can deal damage on defense comparable to Mewtwo. There is one caveat. Ho-Oh has a double weakness to Rock, and is weak to the ever common Vaporeon and Jolteon. But…Solar Beam Ho-Oh is one of the few optimal uses of an off-type coverage move in Pokemon Go. Solar Beam Ho-Oh can one-shot Golem and Omastar. And more importantly, it can easily induce the Rubberband-of-Death. Now Vaporeon can handle Ho-Oh, but you aren’t walking away with a lot of health afterwards. Ho-Oh is the most viable gym defender with a double weakness in the game. Due to the combination of tankiness and DPS, Ho-Oh is the only other Pokemon aside from Mewtwo and Lugia that can beat Blissey without dodging (As long as Blissey doesn’t have Hyper Beam). Ho-Oh with Extrasensory/Solar Beam circumvents some problems Fire types usually encounter as Generalists (Their moves are NVE against much of the meta, thus negating STAB). Gen 2’s Hippie version of Mew has the same exact 600 base stat total, and so it will have the exact same stats as Mew in Pokemon Go. 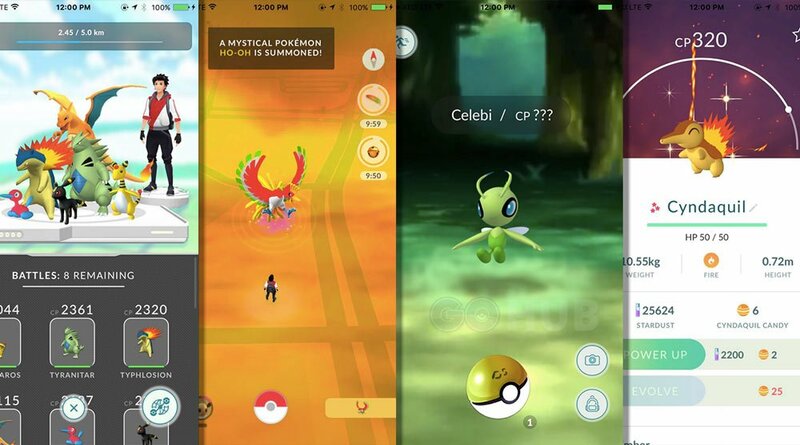 Celebi’s best moveset will be Confusion/Hyper Beam, which puts it on par with Water Gun/Hydro Pump Starmie. Celebi caught the same disease as Mew, Lower-CP-than-Vaporeon-itis. However, unlike Mew, Celebi has access to STAB Confusion, which is the best defensive quick move in the game. Dazzling Gleam hits hard and often, expect C/DG Celebi to put up a defensive performance close to Iron Tail/Stone Edge Tyranitar and Mud Slap/Earthquake Rhydon. The problem is that like those Pokemon, Celebi also has a double weakness (to Bug). This puts it in the precarious position of being mauled by Scizor. Celebi’s access to STAB Confusion, in conjunction with its bulk, gives it the DPS TO shine as generalist, leaving Mew behind in its dust. Celebi has the stats and the moves to be able to beat Blissey (with plenty of dodging of course).